Prince George has been hot property since his arrival last month, and now the Royal Canadian Mint have unveiled their honorary celebration. The corporation revealed two new coins and a special coin set to honour the birth of the future King of England yesterday. His Excellency the Right Honourable David Johnston unveiled the coins, which feature rattles, carriages and tiny shoes. One in three of the coins, which have been designed by Guelph artist Laurie McGaw, show a sleeping baby in a crib with a beaver and a moose. “Canadians are delighted with the recent arrival of The Duke and Duchess of Cambridge’s first child, who will someday be Sovereign of Canada,” said Shelly Glover, Minister of Canadian Heritage and Official Languages. 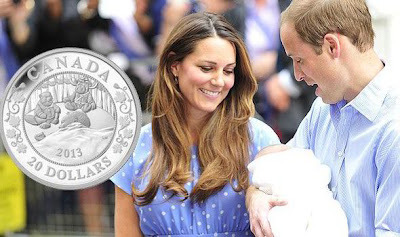 Ian Bennett, President and CEO of the Royal Canadian Mint added: “Each one of these special commemorative coins is struck with the pride and craftsmanship befitting a future King. The coins can be pre-ordered on the Mint’s website – a spokesperson says they’re sure to sell out quickly.